What are “fifth wheels trailers”? A fifth wheel mounts to the middle of a truck bed using a device called a “fifth wheel”, giving this type of unit its name. A hitch extends from the front of the trailer box over the tow vehicle and a horizontal plate that looks like a wheel rests on the tow vehicle for support. This arrangement requires a compatible tow vehicle, usually a full-size truck or custom tow vehicle. The portion of the trailer above the tow vehicle can be used as living space, and is often an upstairs master bedroom. At the Pedata dealership in Arizona, we have many fifth wheel trailer options, new and used fifth wheel trailers, and an online searchable database of fifth wheel trailers for sale. Fifth wheels (travel trailers) range in length from 21 feet to over 40 feet. Many offer the same features as large travel trailers and motor homes, and are sometimes even more spacious. Fifth wheels offer a wide range of floor plans, including multiple slide-out rooms as options. Driving a pick up truck towing a roomy travel trailer with a couple of slide-outs is like having a portable apartment on the run. If the fifth wheel trailer sounds right for your needs, consider buying from the Pedata dealership. Even if you’re not in Arizona, you can buy from Pedata with confidence. Visit our online sales showroom to check our inventory of new and used fifth wheel trailers. Fifth wheels (travel trailers) for sale are priced anywhere from $15,000 to the $100,000 range. As with other recreational vehicles, price is determined by construction quality and interior room available. The good news is that you can find reliable new and used fifth wheel trailers for sale at Pedata RV Center in Arizona. Our online database of fifth wheel trailers for sale can’t be beat! These fifth wheel trailers are similar to inexpensive travel trailers, but the hitch allows for more stability and better handling. Interior construction is similar to that of travel trailers, but with more interior room. Most units have a combination of steel and wood framing with corrugated aluminum siding. The best low-priced units may feature fiberglass and insulation. Check out Pedata’s selection of these types of fifth wheel trailers for sale. As with motorhomes, amenities in mid-range to high end travel trailers can be quite luxurious. These units often feature superior stability, smooth-sided fiberglass exteriors, full body paint decals, hard wood cabinets, all-in-one washer/dryer units, up to four slide-outs, and the list goes on. Check out Pedata’s selection of these types of fifth wheel trailers for sale. No matter which kind of fifth wheel trailer you decide to buy, Pedata’s online searchable inventory of new and used fifth wheel trailers for sale can’t be beat! Even if you’re not in Arizona, you can buy from Pedata with confidence. Visit our online sales showroom to check our inventory of new and used fifth wheel trailers for sale. What Are Fifth Wheels Recreational Vehicles? Fifth wheel recreational vehicles mount to the middle of a truck bed using a device called a “fifth wheel”, giving this type of unit its name. A hitch extends from the front of the trailer box over the tow vehicle and a horizontal plate that looks like a wheel rests on the tow vehicle for support. This arrangement requires a compatible tow vehicle, usually a full-size truck or custom tow vehicle. The portion of the trailer above the tow vehicle can be used as living space, and is often an upstairs master bedroom. 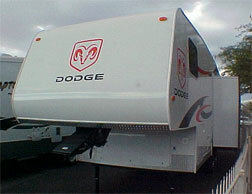 Fifth wheel recreational vehicles range in length from 21 feet to over 40 feet. Many offer the same features as large travel trailers and RVs, and are sometimes even more spacious. Fifth wheel recreational vehicles offer a wide range of floor plans, including multiple slide-out rooms as options. Driving a pick up truck towing a roomy travel trailer with a couple of slide-outs is like having a portable apartment on the run. If the fifth wheel recreational vehicle sounds right for your needs, consider buying from the Pedata dealership. At the Pedata dealership, we have many fifth wheel recreational vehicle options, new and used fifth wheel recreational vehicles, and an online searchable database of fifth wheel recreational vehicles, RVs, toy haulers, campers, and more, for sale. Even if you’re not in Arizona, you can buy from Pedata with confidence. Visit our online sales showroom to check our inventory of new and used fifth wheel recreational vehicles. Fifth wheel recreational vehicles are priced anywhere from $15,000 to the $100,000 range. As with other recreational vehicles, price is determined by construction quality and interior room available. The good news is that you can find reliable new and used fifth wheel recreational vehicle for sale at Pedata RV Center in Arizona. Our online database of fifth wheel recreational vehicles can’t be beat! No matter which kind of fifth wheel recreational vehicle you decide to buy, Pedata’s online searchable inventory of new and used fifth wheel recreational vehicles can’t be beat! Even if you’re not in Arizona, you can buy from Pedata with confidence. Visit our online sales showroom to check our inventory of new and used fifth wheel recreational vehicles, RVs, campers, and toy haulers for sale.